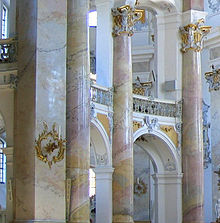 Scagliola (from the Italian scaglia, meaning "chips") is a technique for producing stucco columns, sculptures and other architectural elements that resemble inlays in marble and semi-precious stones. The Scagliola technique came into fashion in 17th-century Tuscany as an effective substitute for costly marble inlays, the pietra dura works created for the Medici family in Florence. Batches of pigmented plaster (ground alabaster or gypsum) modified with animal glue are applied to molds, armatures and pre-plastered wall planes in a manner that accurately mimics natural stone, breccia and marble. In one technique, veining is created by drawing strands of raw silk saturated in pigment through the plaster mix. Another technique involves trowelling on several layers of translucent renders and randomly cutting back to a previous layer to achieve colour differential similar to jasper. When dry, the damp surface was pumiced smooth, then buffed with a linen cloth impregnated with Tripoli (a siliceous rottenstone) and charcoal; finally it was buffed with oiled felt; beeswax was sometimes used for this purpose. Because the colours are integral to the plaster, the pattern is more resistant to scratching than with other techniques, such as painting on wood. There are two scagliola techniques: in traditional Bavarian scagliola coloured batches of plaster of Paris are worked to a stiff, dough-like consistency. The plaster is modified with the addition of animal glues such as isinglass or hide glue. Marezzo scagliola or American scagliola is worked with the pigmented batches of plaster in a liquid state and relies mainly on the use of Keene's cement, a unique gypsum plaster product in which plaster of Paris was steeped in alum or borate, then burned in a kiln and ground to a fine powder; invented around 1840, it sets to an exceptionally hard state. It is typically used without the addition of animal glues. Marezzo scagliola is often called American scagliola because of its widespread use in the United States in the late nineteenth and early twentieth century. Slabs of Marezzo scagliola may be used as table tops. When set, scagliola is hard enough to be turned on a lathe to form vases, balusters and finials. While there is evidence of scagliola decoration in ancient Roman architecture, scagliola decoration became popular in Italian Baroque buildings in the 17th century, and was imitated throughout Europe until the 19th century. An early use of scagliola in England is in a fireplace at Ham House, Surrey, which was brought from Italy along with the window cill in the reign of Charles II. This employs the use of a scagliola background which was then cut into to lay in the design. Superb altar frontals using this technique are to found at the Certosa di Loro at Padula in the Campania, South West Italy. In 1761, a scagliolisto, Domenico Bartoli, from Livorno arrived in London and was employed by William Constable of Burton Constable in Yorkshire. Here he produced two chimneypieces in white marble inlaid with the scagliola embellishments directly into cut matrices in the marble. Apart from the protective edges of altars at Padula this seems to the first use of this technique. In 1766, he went into partnership with Johannes Richter, possibly from Dresden, who may have brought a young Pietro Bossi with him. The name Bossi, however, is associated with a family of Northern Italian scagliolisti. Bartoli certainly supplied table tops to Ireland and one chimneypiece at Belvedere House in Dublin could be attributed to Richter. Their styles are very different. There is little evidence that either of them came to Ireland. Pietro Bossi though arrived in Dublin in 1784 and probably died there in 1798. He produced a number of chimneypieces in Dublin of very good quality. Scagliola inlay proved to be desirable in Ireland and there appears to be a continuation long after it became unfashionable in England. In 1911, Herbert Cescinsky, in English Furnitureremarked that scagliola had been popular in Dublin fifty years before. This would explain one at 86, Stephen's Green, clearly an 18th. Century chimneypiece, which has been later embellished in the mid 19th. Century for Crofton Vanderleur, formerly at 4, Parnell Square. A later firm, Sharpe & Emery, Pearce St., Dublin produce a number of examples in the neo-classical Bossi style, sometimes using original chimneypieces. The correspondence between British Resident in Florence Sir Horace Mann and Horace Walpole describes the process of obtaining a prized scagliola table top. Having received his first top from the Irishman Friar Ferdinando Henrico Hugford (1695–1771) around 1740 Walpole had asked his friend Mann to acquire some more... (one of these tables is at The Vyne. That table has the arms of Walpole (with his post 1726 Garter Knight embellishments) impaling Shorter - for Prime Minister Sir Robert Walpole and his first wife Catherine Shorter, who died 20 August 1737. He married Maria Skerret in early 1738, thus The Vyne's table could seem have been ordered before c1736-37). You bid me get you two scagliola tables, but don't mention the size or any other particulars. The man who made yours is no longer in Florence. Here is a scholar of his [Don Pietro Belloni? ], but vastly inferior to him, and so slow in working that he has been almost three years about a pair for a Mr Leson [Joseph Leeson], and requires still six months more. I will endeavour to get somebody to write to the first friar [Hugford] and to engage him to make two tables in his convent and send them to Florence, of which I hope to be able to give you an account by next post. I am glad your scagliola tables please. You must make the greater account of them, as it is impossible to get any more of the same man [Hugford], nor indeed of his disciple here [Belloni], who is a priest too, and has been four years about a pair I bespoke of him, which he tells me plainly he cannot finish in less than two more. They work for diversion and won't be hurried. The great triumph of the saloon, however, is the use of scagliola, including the richly coloured and figured Sienna shafts of the eight fluted Corinthian columns...and the urns, entablature and balustrade to the second-floor landing which gives access to four plaster-vaulted ante rooms serving the main bedrooms. All this scagliola was produced by Richard Feroze, England's leading contemporary scagliola-maker. Italian plasterworkers produced scagliola columns and pilasters for Robert Adam at Syon House (notably the columns in the Anteroom) and at Kedleston (notably the pilasters in the Saloon). In 1816 the Coade Ornamental Stone Manufactory extended their practice to include scagliola; their scagliola was used by Benjamin Dean Wyatt at Apsley House, London. In the United States scagliola was popular in the 19th and 20th centuries. Important US buildings featuring scagliola include the Mississippi State Capitol in Jackson, Mississippi (1903), Allen County Courthouse in Fort Wayne, Indiana, Belcourt Castle in Newport, Rhode Island, in the old El Paso County Courthouse (Colorado) in Colorado Springs, in the Kansas State Capitol in Topeka, Kansas, in Shea's Performing Arts Center in Buffalo, New York, and in the Navarro County Courthouse in Corsicana, TX. St. Louis Union Station in St. Louis, Missouri, prominently features scagliola in its magnificent Grand Hall, the Rialto Square Theatre, Joliet, IL, Cathedral of St. Helena in Helena, MT, Congregation Shearith Israel in New York City, Milwaukee Public Library Central Library in Milwaukee, WI and the French Lick Resort Casino, French Lick, IN which recently underwent a major restoration. Scagliola has historically been considered an ersatz material and an inexpensive alternative to natural stone. However, it has eventually come to be recognised as an exceptional example of the plasterer's craft and is now prized for its historic value as well as being used in new construction because of its benefits as a plastic material suited to molding in ornate shapes. Scagliola columns are not generally built of the solid material. Instead scagliola is trowelled onto a canvas which is wrapped around the column's core, and the canvas peeled away when semi-hardened. The scagliola is then surfaced in place. The Verde Antique columns and pilasters in the Ante Room at Syon House are made out of marble not Scagliola as it is widely perceived (a beautiful and rare, predominantly green marble that was quarried in Larissa of Greece since antiquity). The intriguing fact with these columns is that they are not solid. Round sections of marble were painstakingly cut as a veneer of an approximate thickness of 5–6 mm and then glued onto a column core that is hollow and was made out of, probably, plaster. On closer inspection the viewer can see the joints of the various sections and the discerning eye will soon realise that what he/she is looking at is in fact Verde Antique veneered marble and not Verde Antique Scagliola. The 3.6 metre high Verde Antique Scagliola columns that can be seen at Dropmore House, Buckinghamshire, are based on the colours and design of this historical work at Syon House and both research and execution of these new columns were undertaken recently by the contemporary Scagliolist Michael Koumbouzis. John Fleming, "The Hugfords of Florence", The Connoisseur, 1955, cxxxvi. 109. R. de Salis, Fane-Stanhope scagliola, London, 2008. Patrick Pilkington: The Chimneypiece in Ireland in the 18th. Century, Ireland's Antiques & Period Properties, Vol. 5, no.2, 2008-9 pp. 78-82. ^ Scagliola. In: Weyer, Angela; Roig Picazo, Pilar; Pop, Daniel; Cassar, JoAnn; Özköse, Aysun; Vallet, Jean-Marc; Srša, Ivan, eds. (2015). EwaGlos. European Illustrated Glossary Of Conservation Terms For Wall Paintings And Architectural Surfaces. English Definitions with translations into Bulgarian, Croatian, French, German, Hungarian, Italian, Polish, Romanian, Spanish and Turkish. Petersberg: Michael Imhof. p. 116. doi:10.5165/hawk-hhg/233. ^ Henry, Alison; Stewart, John, eds. (2011). Practical building conservation. Mortars, plasters and renders. Farnham/Burlington: Ashgate Publishing. p. 607. ^ Prudon, Theodore H. M. (1989). "Simulating Stone, 1860–1940: Artificial Marble, Artificial Stone, and Cast Stone". APT Bulletin. 21 (3–4): 79–91. doi:10.2307/1504299. JSTOR 1504299. ^ John Martin Robinson in Country Life, December 8, 2005. ^ John E. Ruch, "Regency Coade: A Study of the Coade Record Books, 1813–21" Architectural History 11 (1968, pp. 34–56, 106–107) pp. 35, 39. ^ Staehli, Alfred M. (1984). "Scagliola: Restoration of an Antique Plaster Finish in the Portland City Hall, Oregon". Bulletin of the Association for Preservation Technology. 16 (2): 44–50. doi:10.2307/1494001. JSTOR 1494001.